Tropical dance mavens Kisses played the Miami Vice-era grooves one would expect during their opening DJ set, changing things up with Whitney Houston’s “How Will I Know” (jam!) and Justin Bieber’s, ahem, “Baby, which kinda ruled. Baths, a Freaks and Geeks-era Seth Rogen in Clark Duke glasses, played the night’s most energetic — and best — set, turning the music of his self-titled debut into a seamless bouncing of knob-twirling, live singing, throbbing bass and endless enthusiasm. The pretty/rhythmic dynamic of the album remained intact, though the Echoplex crowd seemed about as interested in dancing as a Mathlete at senior prom. Memoryhouse, the band I came to see, started strong with a fuzzy version of “Lately,” but ran into amp troubles in the middle of “To The Lighthouse,” their upcoming single. The group, now a trio, is so delicate on record — live, the distortion washed out some of their subtlety, but the new material was promising. Guitarist/bassist Adrian Vieni told me after the show that the group plans to record their sample-free but same-vibes full-length in December — at the rate I’m playing The Years EP, 2011 can’t come soon enough. Nite Jewel, an L.A. band lost so far in my interminably shuffling iTunes, was an impressive enough headliner, blending wild-eyed Kate Bush vocals with the cool simplicity of that Junior Boys song you still put on mixtapes. Recommended if you like the Golden Filter, “Heartbeats,” or any of the dozen female-fronted synth acts currently stacking up in the blogosphere like so many Lego blocks. 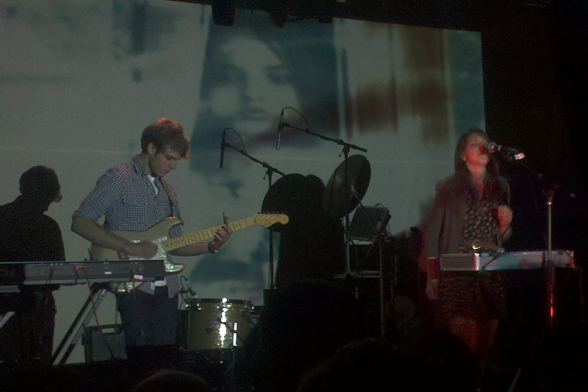 “This is our first time playing the Echoplex,” frontwoman Romana Gonzalez told the applauding crowd. “Everybody told us it sounded bad, but it sounds pretty… good from up here!” Sounds about right.